[The eruption] has continued without explosive venting visible from a distance. Observers on a boat that passed Marchena on 7 or 8 November reported vigorous steaming at the W coast. Water near the flow front was too hot to touch and numerous fumaroles were evident inland. Since David Day's 28-30 September visit, lava had formed a single broad front at the coast, closing the small bay where Day had landed. Reports collected by Day provided additional information about the timing and characteristics of the early phases of the eruption. The first reported activity was a "suspicious" large cloud seen over Marchena on 25 September at 1840 from ~65 km S (at Bartolomé). 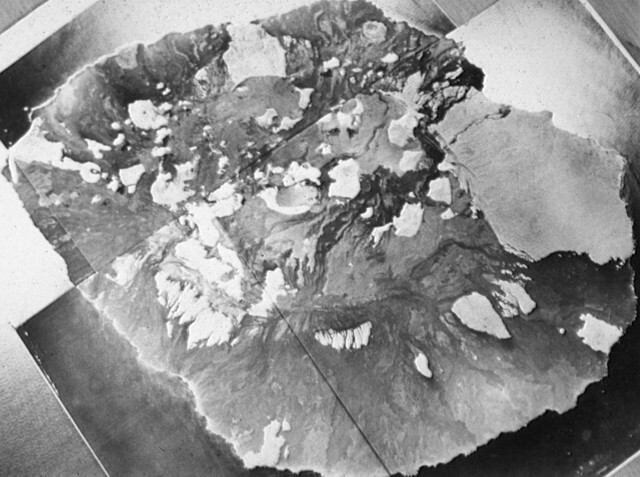 An explosion was observed at 1905 from ~90 km SSE (Turtle Cove, Santa Cruz Island). A low white cloud near the coast was seen with infrared binoculars at about 2100. Witnesses at three sites ~65 km S reported 7-8 evenly spaced vents that remained active throughout the night. Incandescent ejecta appeared to rise roughly the equivalent of the island's elevation (~350 m), with height increases of ~25% during the strongest activity. A more vigorous vent, lying W of the others, was first seen at about 0300 on 26 September. Ejecta heights from the W vent appeared to exceed those from the other vents by ~50%. Information Contacts: D. Day, Isla Santa Cruz. The Global Volcanism Program has no Weekly Reports available for Marchena. Marchena . . . started erupting on 25 September. The TOMS instrument aboard the Nimbus-7 satellite passed at about 1100 and sensed no SO2, but the next pass, at the same time on 26 September, mapped a 300-km plume to the SW with an SO2 content estimated to be close to 100 kt. High SO2 values immediately over the volcano indicated that the eruption was still vigorous at that time. On the following day the plume was nearly twice as long, but had almost vanished by the same time on 28 September. Weather satellite images during this period showed low cloud cover, but no conclusive indication of the volcanic plume. . . .
Information Contacts: A. Carrasco, Charles Darwin Research Station; S. Doiron, GSFC; SAB. The eruption was first observed on 25 September at about 2100 from a ship ~ 75 km S of Marchena [but see 16:10], and glow remained visible through the night. A large black and white eruption cloud was reported the next day, but no glow was evident during cloudy weather that night from a nearby island. During an overflight around midday on 27 September, a dark plume was visible above low weather clouds. When David Day and others arrived at the island's W coast on 28 September at about 2230, lava was flowing into the sea along a front ~1.5 km wide. Incandescence was evident at about 10 sites over a roughly 3 x 3 km area, but lava fountaining had apparently stopped. The next day, small quantities of Pele's hair were found on the beach near the fresh flows, along with substantial numbers of dead fish and other marine organisms. Scuba divers found glassy breccia near the shore, a zone of aa rubble extending seaward for several hundred meters, and, with gradual increase in slope from 25 to 35 m depth, a small lava flow that included pillow structures. A 30 September summit climb revealed new lava covering much of the caldera's SW floor, suggesting that a circumferential fissure several kilometers long had been active on the W to SW rim, supplying lava to both the caldera floor and the outer flank. 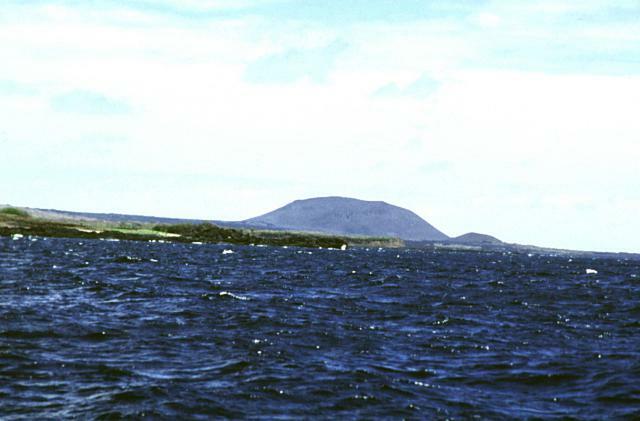 The low shield volcano forming Marchena Island contains one of the largest calderas of the Galápagos Islands. The 6 x 7 km caldera and its outer flanks have been largely buried by a cluster of pyroclastic cones and associated lava flows. Its first historical eruption occurred in 1991. Other young lava flows, some of which may be only a few thousand, or even a few hundred years old, filled the caldera and flowed down its outer forested flanks, in some cases to the sea. Vicenzi E P, McBirney A R, White W M, Hamilton M, 1990. The geology and geochemistry of Isla Marchena, Galapagos Archipelago: an ocean island adjacent to a mid-ocean ridge. J. Volcanol. Geotherm. Res., 40: 291-315. There is no Deformation History data available for Marchena. The low shield volcano forming Marchena Island contains one of the largest calderas of the Galápagos Islands. A group of pyroclastic cones was constructed inside the caldera. Lava flows originating from the 6 x 7 km wide caldera have spilled through low points on the caldera rim and flowed down the flanks of the volcano, in some cases reaching the sea. The first historical eruption of Marchena occurred in 1991. Aerial photos by Instituto Geográfico Militar (courtesy of Minard Hall). A large tuff cone rises near Punta Calle on the southern coast of Marchena Island beyond fresh-looking lava flows west of the cone in the foreground. The low shield volcano forming Marchena Island contains one of the largest calderas of the Galápagos Islands. In contrast to other Galápagos volcanoes, the 6 x 7 km caldera and its outer flanks have been largely buried by a cluster of pyroclastic cones and associated lava flows. The first historical eruption of Marchena occurred in 1991. Photo by Ed Vicenzi, 1984 (Smithsonian Institution). The Global Volcanism Program has no maps available for Marchena. The following 57 samples associated with this volcano can be found in the Smithsonian's NMNH Department of Mineral Sciences collections, and may be availble for research (contact the Rock and Ore Collections Manager). Catalog number links will open a window with more information. Large Eruptions of Marchena Information about large Quaternary eruptions (VEI >= 4) is cataloged in the Large Magnitude Explosive Volcanic Eruptions (LaMEVE) database of the Volcano Global Risk Identification and Analysis Project (VOGRIPA).